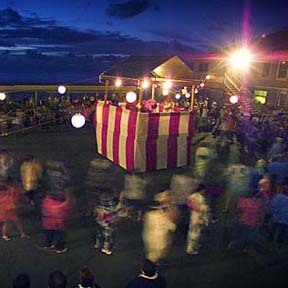 People danced to Tanko Bushi at the Haleiwa Jodo Mission bon dance last night. During the Buddhist obon, or "lantern festival," ancestors are honored through ritual, music and dance. Hanging lights guide the way for the spirits of ancestors, who are greeted with offerings of flowers, food and incense in temples and on family altars. »Holoholo Honolulu: Territorial Office Bldg.